If you are looking for the natural beauty of a wood fence for your Charlotte property, count on us to install it for lasting enjoyment. Aluminum fences come in several different style and color options, so you can choose the type that works best for your property in Charlotte. Do you have a specific fencing material in mind, or are you interested in created an appealing landscape? 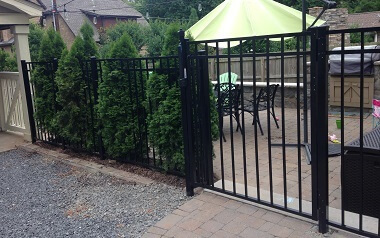 We have the skills and expertise to install a variety of different Charlotte fence styles on your residential or commercial property. 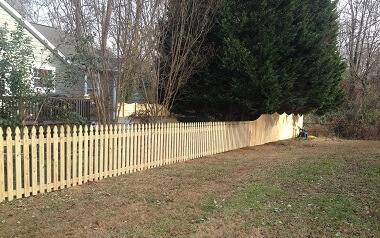 If you have questions about our fencing services in Charlotte, North Carolina or you would like to schedule a quote, contact us today for more information about how we can assist you. 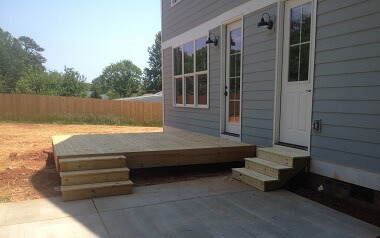 We have years of experience providing the construction and installation of decks in Charlotte. Adding a deck to your home or business can make your entire outdoor living area look and feel different. When you work with our experienced team, you will find that, no matter what your fence preferences may be for your Charlotte home or business, we can provide the installation solutions you need for the best results. If you are interested in learning more about our services at Timber Fencing, contact us today to learn how we can assist you with gates, Charlotte fencing, deck construction, paver installation and more. Personal Service – Personal service is one of the things that sets us apart at Timber Fencing (a Charlotte Fence Company). Our small business approach to your project means you’ll work directly with us to achieve your outdoor construction goals. Attention to Detail – When you are taking the time to invest in a new Charlotte fence, patio, or deck, you want the construction to be completed correctly and with your vision in mind. We’ll always pay attention to the details during your project, making sure you are fully satisfied with the results. Customer Satisfaction – Customer satisfaction is our first priority, and because you can work with us from your initial quote through your project’s completion, we will always be available to listen to your needs and make sure everything is going as planned. We enjoy hearing from our happy customers that they love their new Charlotte fence, patio, or deck. We are passionate about building a product that our customers will enjoy for years to come, all at a fair price with quality materials. It is our greatest pleasure to see a happy customer when their deck construction, patio installation, or Charlotte fencing project is completed to satisfaction. When you want to improve the security, aesthetics, or function of your property, there are few things that enhance your outdoor space like a deck, patio or new Charlotte fence. At Timber Fencing, we offer complete construction of decks and fencing, including gate and paver installation in the greater Charlotte area. Contact us at Timber Fencing today to schedule a quote for your fencing, deck, or patio project in Charlotte. We look forward to hearing from you! Are Flowering Vines Safe for Your Garden Fence?